The return of the popular Disney Egg-stravaganza at Disneyland park, Disney California Adventure park and Epcot, is fast approaching. The Egg-stravagnaza will run from March 27 – April 5, 2015. 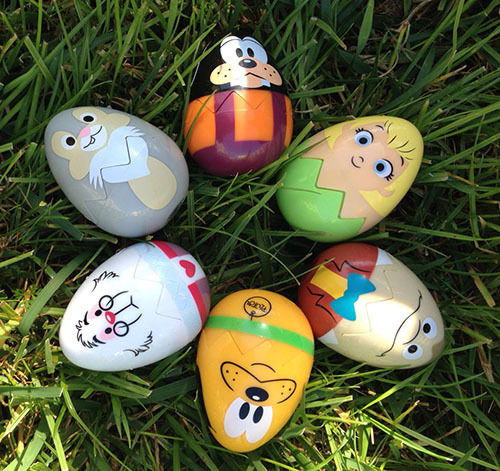 You will feel like a kid again as you search for hidden Disney character themed eggs. You get to go on a scavenger hunt looking for the adorable eggs. You keep track of your discoveries by putting a sticker on the Egg- stravaganza map to mark the spot. You do have to buy the maps and stickers. They cost $4.95, plus tax and can be found at the following locations. Epcot – Heritage Manor Gifts (American Adventure Pavilion), Pin Central, Plaza Towers (Port of Entry) and World Traveler (International Gateway). Whether you hunt for eggs or not just return your map to a redemption location by April 30th to participate in the ‘egg-scramble’and to pick up your surprise. There will be some egg-citing new surprises this year! A day at Disney is always magical. A holiday spent at Disney is extra magical! Book your Easter vacation now to make sure you get the good discounts! Contact me at maria@worldofmagictravel.com for your FREE no obligation quote. Where can I get the plastic eggs that are pictured?